These exercises are commonly seen yet, if you do them, you stand a good chance of hurting yourself. Find out what they are and why they can injure you. The upright row is one of the most harmful exercises you can expose your shoulders to. 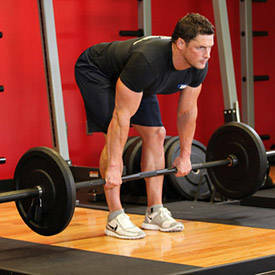 The problem with the exercise lies in the position your arms must be in in order to perform the movement. This position is called "internal rotation." To demonstrate internal rotation, hold your arms straight out to the sides with your palms down. Now rotate your hands forward as if you were pouring out a glass of water in each. 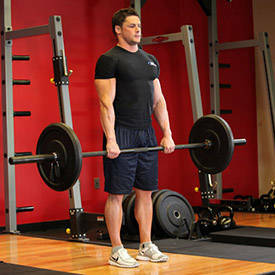 To do the upright row, the arms are bent at the elbow then internally rotated. Internal rotation itself is not necessarily bad for your shoulders. The problem comes when you raise the arms up and add resistance in that position. Every time you raise the weight, a small tendon in your shoulder gets pinched (known as impingement) by the bones in the shoulder. This may not hurt immediately; it may not even hurt for a long, long time. The problem is the tendon will gradually become worn down and damaged. You may not even know you have a problem until one day the tendon snaps! 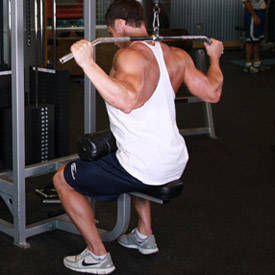 To do the behind-the-neck pulldown as normally instructed, you must externally rotate your shoulders as much as possible. This is a very delicate position for your shoulders. The supporting muscles of the shoulders (known as the rotator cuff) are not in a good position to stabilize the joint and injury to those supporting muscles can result, which can lead to further injury in the connective tissue of the joint. The behind-the-neck press gives us the same shoulder issues associated with the behind-the-neck pull-down. 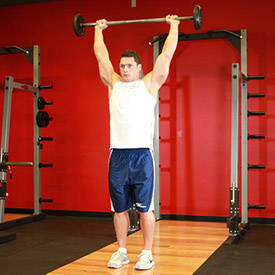 To do the movement, you must maximally externally rotate the shoulders. Again, this places the shoulders in a very vulnerable position, which can easily result in strain in the rotator cuff muscles. Also, as with the pulldowns, most people simply don't have the necessary shoulder flexibility to get a straight line on the movement—they must tilt their head forward to get the bar behind it, adding greatly to the possibility of injury. Without the arch, as a natural result, the spine will flex and the supporting muscles of the spine will relax. This places much of the tension of the exercise directly on the connective tissue and bones of the spinal column rather than the supporting muscles, which are stabilizing the spine. In an effort to get more stretch on the hamstrings, you instead compromise the support structures of your lower back. If you enjoy having a pain-free lower back, the regular floor sit-up is a good exercise to avoid. When you do a sit-up, the mechanics of the movement and position of your body throw much of the torque of the movement onto your lower back. Your hip flexors pull directly on your spine in order to raise your torso off the floor when you do the exercise, leading to strain in the lower back area. You will be far better off performing direct abdominal- training movements such as crunches, ball crunches, cable crunches, etc. These exercises directly target the abs without throwing excessive tension on the lower back.